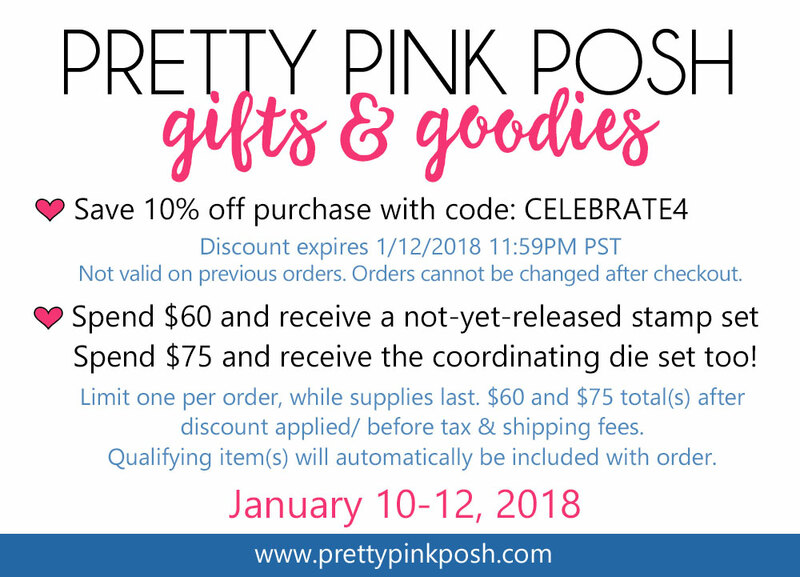 Papell with Love: PRETTY PINK POSH TURNS 4! 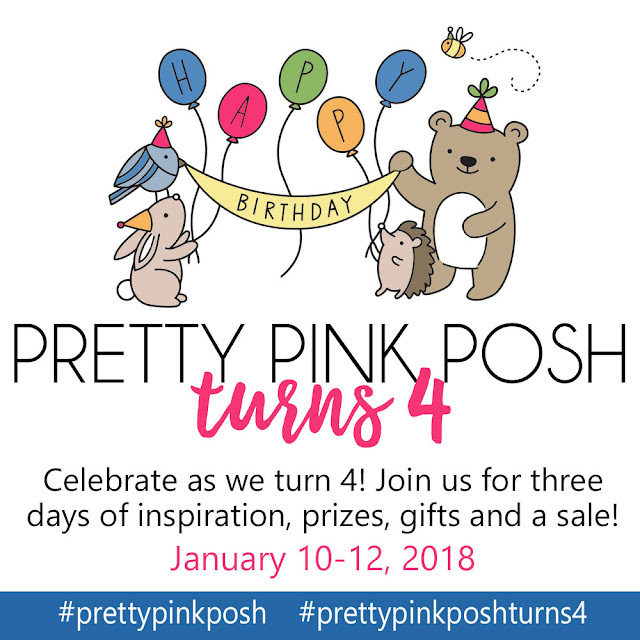 Hello Everyone, welcome to Pretty Pink Posh's 4th Birthday! For today's project I used Birthday Friends Stamp set and Birthday Friends Die set. 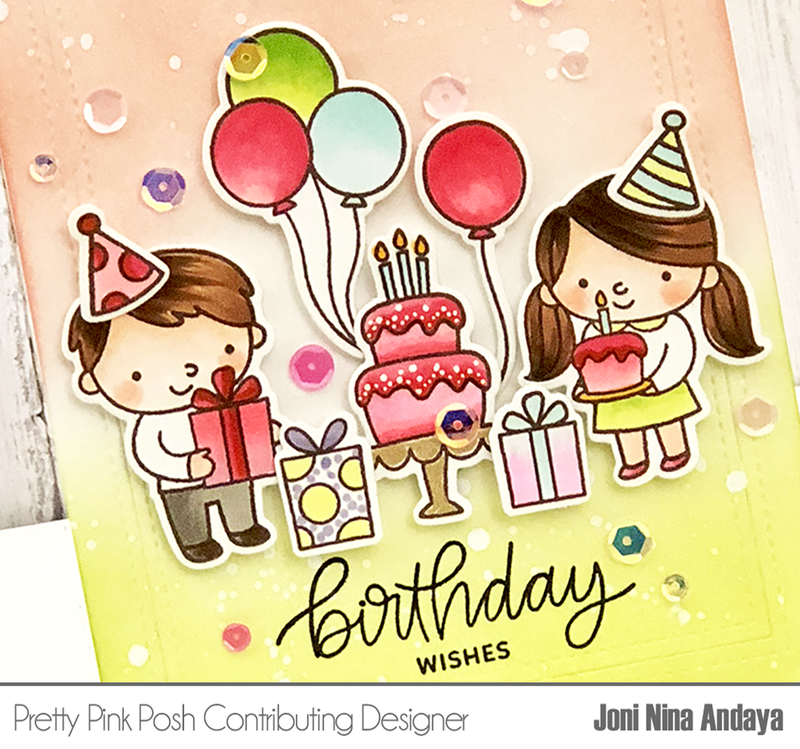 For this project I used the cute set Birthday Scene stamp set. I stamped the image on a white cardstock and color with Copic makers. Then distressed the bottom part with Cracked Pistachio Dye Ink for interest in the card. I also added some Sparkling Clear Confetti Mix to finish the card. GIVEAWAY: We’ll be giving away 2 $50 gift certificates to random comments left on the different stops every day! That’s right, we’re giving away a total of SIX $50 gift certificates! Lovely cards, I like the delicate colours and your cute scenes! What a sweet release! Thanks for sharing! Very cute cards - luv your designs and color combos. OH MY GOSH, I love both cards, for different reasons. And I love your coloring. I have so much to learn from you ladies, mostly about shading. Thank you for your example--I'm going to go back and look at them again so I can learn to shade better. My work is extremely FLAT. These cards are just gorgeous! I love the cheerful colors and the happy feeling! Really fabulous cards! Thanks for sharing them! Absolutely love both of them! Love the soft,inked backgrounds on both the cards and your colouring is great! Adorable cards! Your coloring and backgrounds are fabulous! How I love your cards! Beautiful coloring and such adorable images! Love the color combo you used for your cards. Super cute and great job. I love the color choices especially on your cards! very fun - love the coloring details - thanks for the inspiration! Love the color combo on your birthday wishes card. Very nice. Love the muted tones for the background. Really makes the stamped elements pop. Super cute cards! Love your unexpected background color choice! 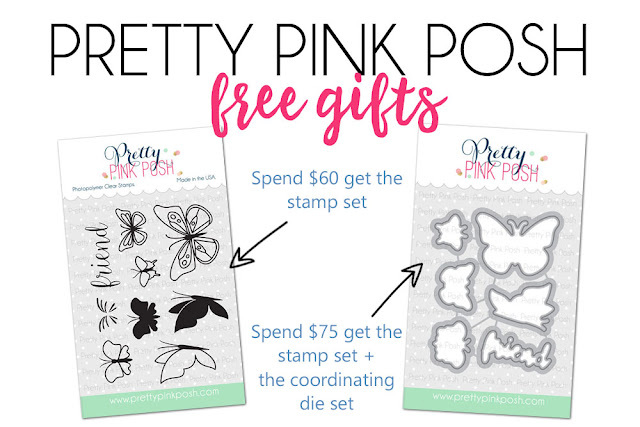 These stamps sets are so cute! The way you used them is perfect! Beautiful cards! The colors are amazing, thanks for sharing. Your cards are super Adorable! I love the soft colors you used on your first card. So adorable! Love the blended backgrounds! Such cute new stamps this release!!! Love both cards! The kids and animals are so adorable. They are happy cards that make me smile. Thanks for the inspiration. Fantastic cards, love this release. Beautiful cards, loving the new releases! I’m thinking birthday friends is my favorite because of all the awesome projects I’m seeing. Your little white dot details made all the difference on those little critters. Great job. 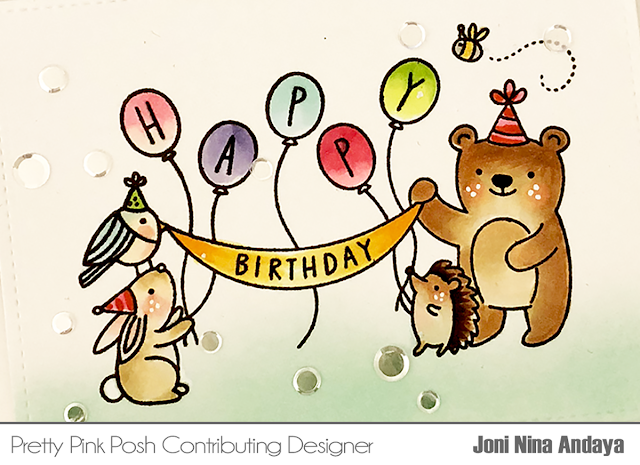 Cute and festive birthday cards! love the happy birthday stamp set! Love the way you colored the bears. So cute! Amazing cards, love your backgrounds! Both cards are adorable ... so cute! Your cards are beautiful ! I love the colors you've selected. Adoeable cards, Joni! So very festive! Hi! I really love your cards!! I really like the colors you used!! Thank you for sharing! Happy Birthday to Pretty Pink Posh!!!! Cute cards! Great coloring as well! Your coloring is simply amazing! Both cards are fabulous. I love the sweet birdie sitting on the bunny's head; so adorbs! 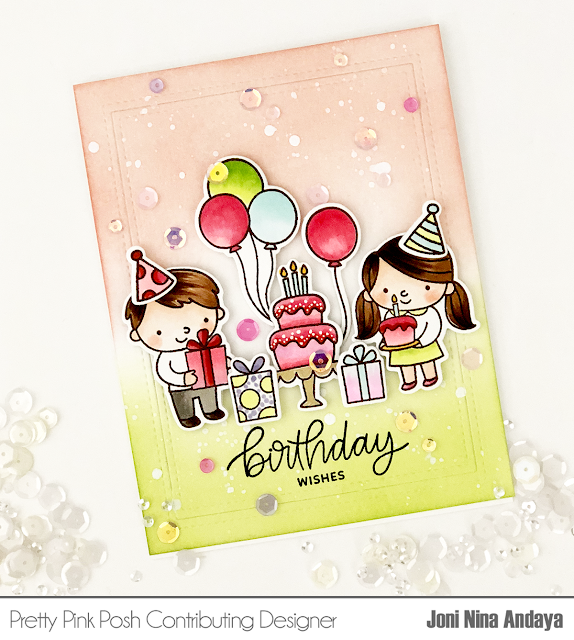 The pastel colors make a wonderful card, love that idea. Adorable cards Joni! The first one if my fav. Love the distress background! Awwww Joni, these are just precious! This is such a great release, so much eye candy. Well done. Such a great company, thank you for the inspiration! Adorable cards! This is an awesome release as always. Love everything about it!! Fun Cards! I really like your use of the soft color backgrounds. This release is quite fun! Thank you for sharing both your cards. I like the colours and the sequins you used, Joni. Your creations blow me away; you are so talented! Wow your cards are so pretty...love the inking and the cute images. I love the colors on both cards! Twisted Citron and Tattered Rose, what a beautiful color combination!! I would never think of those together, but they're stunning! So are your cards also!! Darling cards with the Birthday Friends set! Love your pretty coloring! Happy 4th Birthday to PPP! Joni, always love your cards...these are perfect! So lovely. Thanks for the beautiful inspiration. Love you cards, thanks for the inspiration. Great designs!! Love how you used the sparkle accents for such a festive feel! The soft colors are pretty! You've created such cute scenes! The sequin accents are very pretty. Wow! Fantastic cards! They are so adorable with your amazing coloring! Both of your cards are so sweet! I love the soft colors you used including the sequins! Such pretty cards! Love the white dots on the cake! Just a cute little touch. 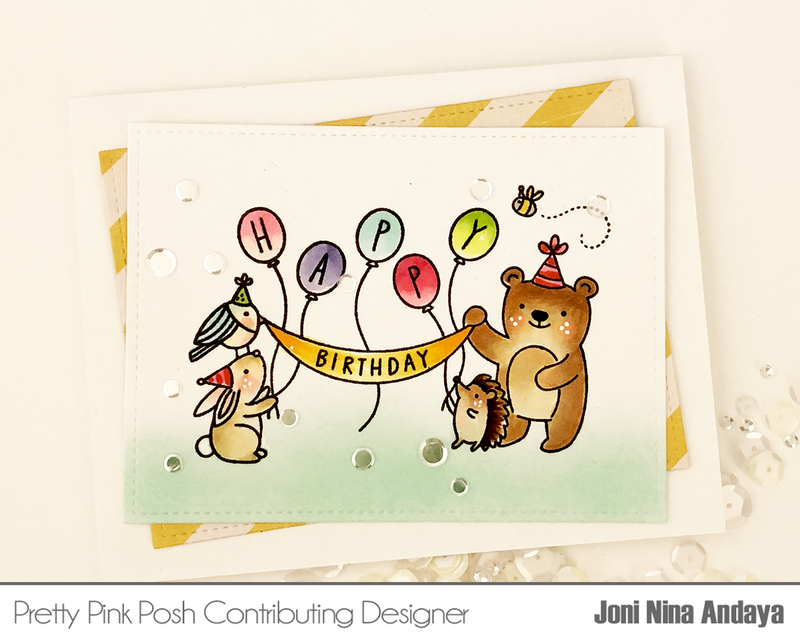 I love the card you made with the Birthday Friends set! The sequins make the card so pretty and the little kids from the set are super adorable! Oh my gosh I need those little kids. The cute scenes I've seen on the hop. I love the fun party scene you created. The critter happy birthday card is just so cute also. Love the new release. Sweet and delightful, the background colors are awesome, thanks for sharing! Awww!!! How sweet!!! Both these cards are sooo cute!!! Its a party! Pretty looks! I love your cards! I also love the one you made yesterday with the Birthday Friends set. So cute! Joni, I'm smiling allllll over my face in seeing your sweet, colourful cards. The kids are adorable; the critters, charming; your colouring, stellar! Perfect showcases of the new release! I can tell you had a blast designing these; they're infused with joy! Your cards are so beautiful. I hope to one day be able to color like you. Beautiful cards with fabulous colour palettes. I love the grouping of the elements on your first card. Thanks for the inspiration. Both cards are so sweet but I must say when I look at your first card that's a party I want to be invited to tfs. 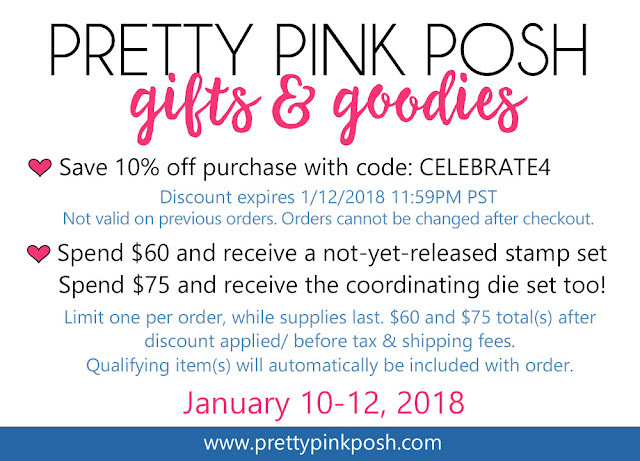 Love these stamps and your cards are fabulous. These Birthday Friends are adorable. Such fun, happy cards! And I love your coloring too! What great colors for your backgrounds! Great cards. Thanks for sharing. Love your fabulous, colorful cards. The little kids and critter stamps are adorable. Great cards and colouring...the little people are too adorable! Adorable cards, you do super backgrounds. Wow!!! I love the color combination you choose. They are very sweet. Amazing cards! Love the sparkly touch of sequins! These are fantastic cards ! Your smooth backgrounds are amazing ! Love your cards and your color choices! I'm so envious of your coloring! These look great! Gorgeous cards....love your coloring and those sweet kids! Both of your cards are just so adorable! Love your backgrounds. Cards are beautiful. Absolutely adorable! So fun! Love your use of the sequins! I love your blended background. Cute card. Time for me to get busy and make some birthday cards...great inspiration....your cards are great fun....thank you so much. This release from PPP is filled with such sweet images and sentiments!! Your cards show them off wonderfully! Thanks for sharing your talent and creativity!! What adorable cards and the coloring is perfect! Your cards are great! So colorful. Love your cards. Such pretty designs!